I welcome children and parents as they arrive. They read the morning message and children find their names on the A3 class list (removed from the picture below for privacy reasons). Children read their names as they choose from two groups of 25 sticky-backed name tags spread on separate tables: one name tag goes on their shirts for identification and one labels his/her backpack spot on the shelves. Parents leave as their children settle. Children gather on the class mat. I say my name and write ‘Mrs. Swan’ on the whiteboard. We read it. Someone says, “Swan starts with S.” Another exclaims, “My name starts with S too!” I ask the ‘S’ children to stand and later, we write a list of the ‘S’ names on the whiteboard (phonics from the children). Children stand up, one at a time, as I show the name cards. Today, everybody recognises and reads their name. We also read the names on the A3 class list (in alphabetical order) on the whiteboard. Using a metre-stick, I point to the words on a big, rhyme chart and read: Jump, jump, jump all day… Children jump and act out the rhyme. Those who can read, join in. The class reads and moves to all four rhyme charts: Jump, Teddy Bear, Teddy Bear, Tall as a House and Jack be Nimble. 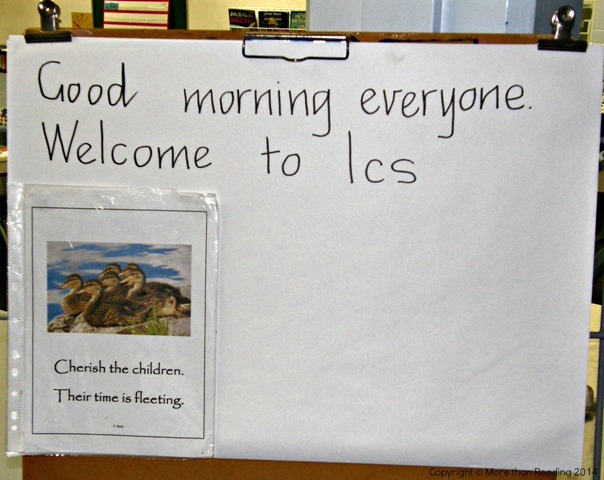 (Note: few charts and cards are displayed on the first day because most literacy displays are built with the children from day one). 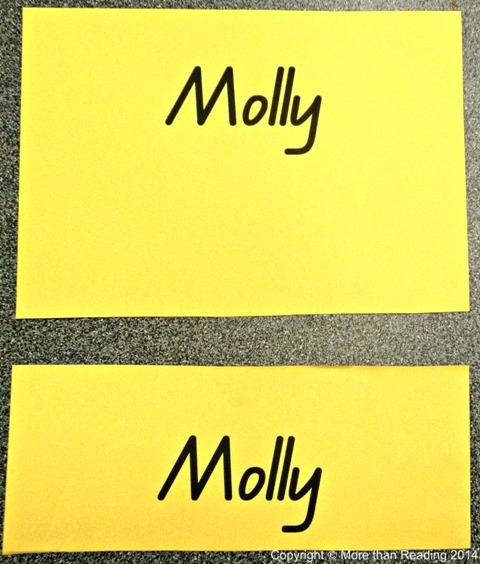 Using coloured markers, children draw small self portraits on their pre-printed name cards. Sharing name cards with the group, children re-read their names. I collect the cards and after school, laminate them for use all year. The name cards go into a plastic tub (labelled Our Names) for children to use for reading, copying friends’ names, word matching and spelling. Each child personalises the larger name card with a picture of him/herself. for children to access all year as needed. The class gathers on the mat in front of the whiteboard. ‘Now that we are in Year One (or Prep) how will we behave in our room?’ The children discuss expected behaviours and I quickly scribe their suggestions on the whiteboard (in positive language), then read them with the class. Talk is about things we DO, e.g. we walk; we use quiet voices; we share; NOT things we don’t do. During shared writing, we establish the expected classroom behaviours. reading and understanding letters in writing and reading. After school, I type the ‘behaviours’ on an A3 chart in enlarged print (using positive language) and blue tac it to the whiteboard. We refer to and read the chart frequently in the first weeks to acknowledge children doing the right thing and to reinforce the expected behaviours. Time to walk around outside to familiarise the children with locations of the library, play areas, office and toilets. Children read the labels: Toilets, Boys, Girls. Before the toilet break, I emphasise hygiene and washing hands. 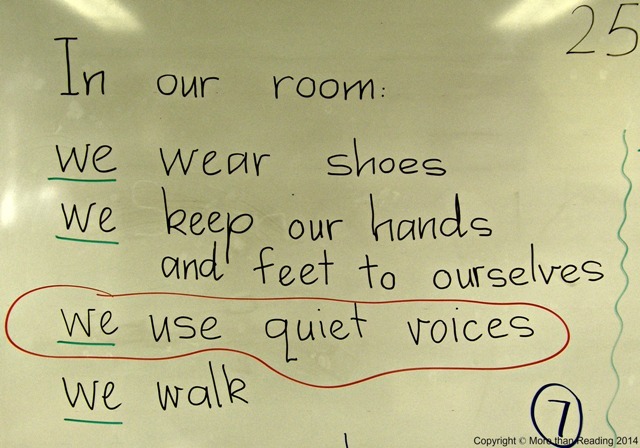 Children walk quietly back to the classroom so as not to disturb other classes. Children hear stories about beginning school: Little Critter Goes to School (Mercer Mayer), Spot Goes to School (Eric Hill) and discuss feeling safe at school. Children read and move to action rhymes. Rule of thumb: children sit fairly still for their age plus 3 minutes, i.e. age 5 plus 3 = 8 minutes. Not long! Children, especially in the early years, require plenty of opportunities for large muscle movement! The children sit in front of the whiteboard and I talk about children learning to write. Suggestions are encouraged for sentences about the first day and I scribe what comes up (see picture below from 2011). 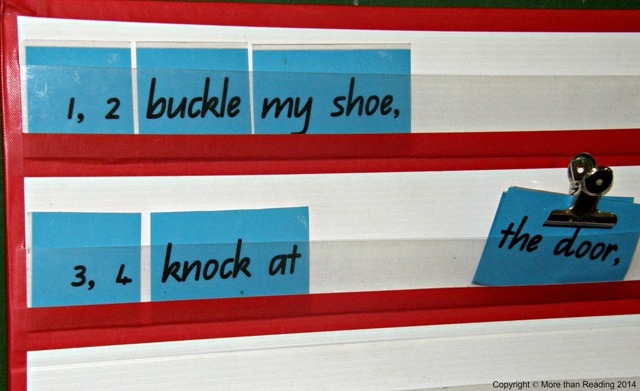 Several children notice words that are the same and early sight words (is, we, a). 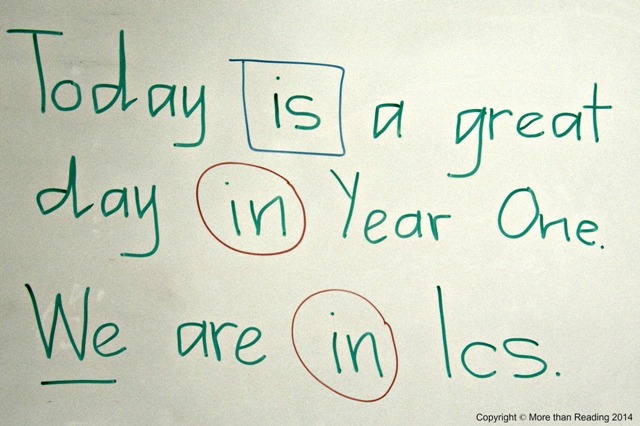 On the first day, children are talking about language, writing and reading. are understanding how letters and sounds ‘work’ in writing and reading. We use the pocket chart for reading and moving. Children read (and predict) words as I put the word cards into the pockets, one at a time. We re-read and act out the rhyme. word stands alone, as well as being a part of a sentence. To establish the lunch routine I start around 10:30 and go slowly so children understand the procedure: get hats, lunch boxes, drinks and sit/eat in the balcony area, put lunch boxes away, go out to play. On the first day, I take the class to the play area to ensure the children know where to play and on which equipment. I am at the line up area early to reassure children they are at the right spot. The morning goes well. I’m happy to see that all children can read their name cards. I constantly make mental notes about which children appear to understand print and letters and which ones don’t. Sometimes you know right away. Some times it’s a hunch and you need to gather more evidence. 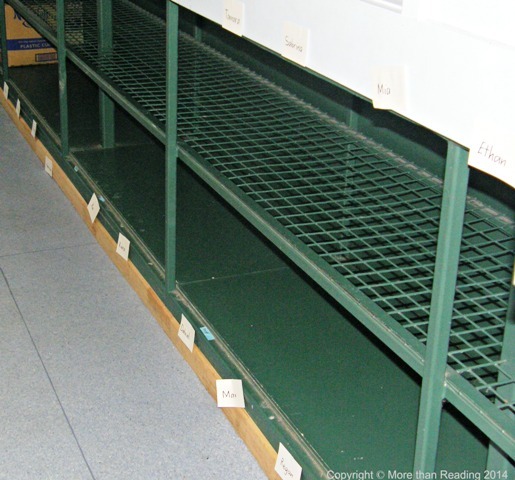 Establishing routines is necessarily slow and deliberate, especially packing up materials, getting lunches from the fridge, eating lunch and lining up downstairs. Experience has taught me that it’s worth doing the extra work this week to ensure that children understand the steps in routines and the need for routines.